Here’s a benefit auction item idea that will prove popular at your gala: the opportunity to dine at the chef’s table in a restaurant. What is the chef’s table? 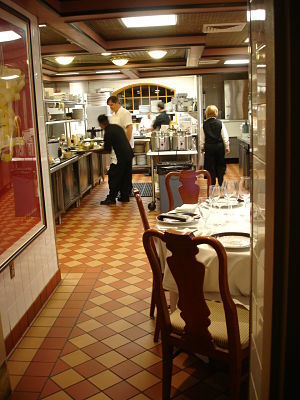 Not every restaurant has one, but a chef’s table is a table situated within the kitchen of the restaurant. As with real estate, what makes this table unique is the location, the location, the location. By virtue of where it sits (in the kitchen), the table allows the guests to see how their food is being prepared, observe communication among the kitchen staff, and generally experience the inner workings of a busy restaurant kitchen. The uniqueness of the experience is what makes this auction item popular. It’s always nice to go out for a good meal. But it’s even a more fascinating experience to eat out when you are literally in the middle of the hustle and bustle of a busy kitchen. It gives you a new dimension as you’re dining in the kitchen, but out of the home. 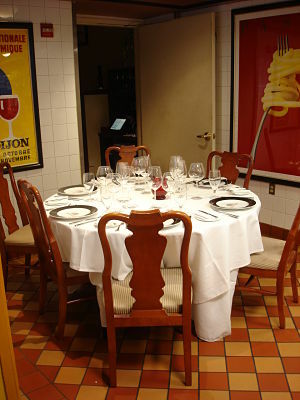 Sometimes a restaurant will book the chef’s table when the restaurant is at capacity. Other times the table might be left vacant unless a special customer arrives. A few years ago while attending a conference in Pittsburgh, PA, my colleagues and I headed down to an Italian restaurant located in the area known as South Side. I have since forgotten the name of the restaurant, but I haven’t forgotten the experience. The restaurant was very busy, and the only table large enough to accommodate our entire group was the chef’s table in the kitchen. “Would you mind eating there?” the hostess inquired. We were ecstatic! We got to enjoy a fabulous meal and have a unique view of the restaurant which no one else did. When soliciting for donations from restaurants, ask if they have a chef’s table. If they do, would they mind donating a dinner at that table? It’s a better donation for you, and doesn’t “cost” the restaurant additional money.